An ice pick is an essential household tool used to break large blocks of ice into smaller pieces for chilled drinks. The best ice picks are made of durable materials that are resistant to rust and strong enough to handle hard ice blocks. The handle should provide you with a comfortable and firm grip to make your work easy and safe. This article reviews the best ice picks on the market and their materials, design, and overall quality. We also take a look at ratings and reviews from verified customers to make sure the information we provide is accurate. The Fox Run ice chipping tool comes with a wooden cover to keep the pick from causing injury or dulling. 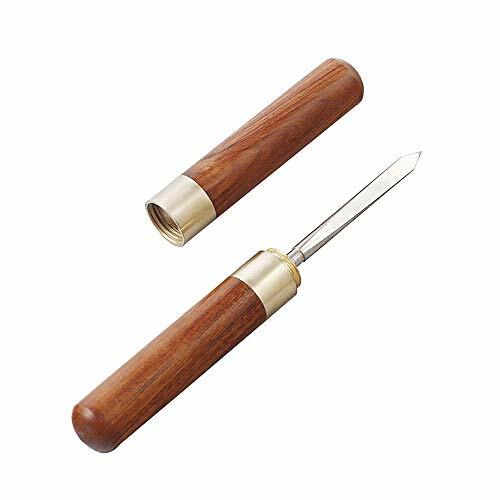 The wooden handle has a stylish design and matches the cover perfectly. 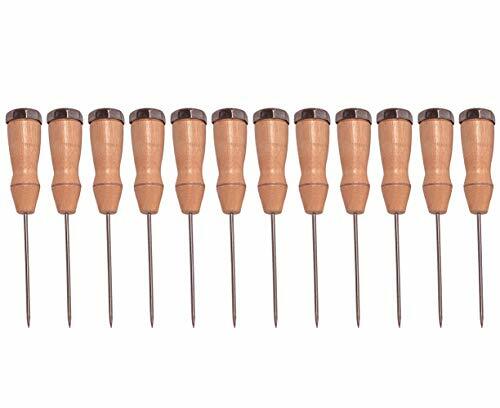 The pick is manufactured from chrome-plated steel to make it sturdier and more resistant to rust than pure steel. The extra strong pick makes the tool ideal for breaking through hard ice blocks. This ice pick measures 2 x 2 x 7.5 inches from the tip of the pick to the end of the handle and the pick is 4 inches long. 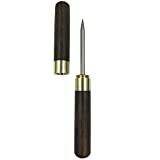 This Winco ice-breaker tool is made of a wooden handle whose tail is fitted with a steel ring. Its elegant design makes it an excellent ice breaking tool for parties, food preparation stores, camping, and for home use. The pick is made of steel, a sturdy, rust-resistant, and non-corrosive material. The manufacturer recommends that you wash your hands before handling because this nice tool can quickly catch stains. The Winco measures 9 x 1.5 x 9 inches and weighs 2.4 ounces. The tool is made of a wooden handle whose base is fitted with a metal ring used for ice cracking. The pick is made of carbon steel, which does not compromise the quality of your ice with metal shavings. Similarly, carbon steel is hard and sharp, a condition that gives the tool an advantage of breaking through high-density ice. 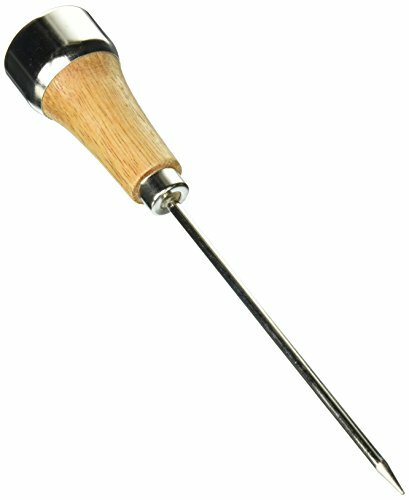 The Good Cook ice pick measures 11.8 x 2 x 4 inches and weighs 1.6 ounces. With metal ice cracking ring at base. The tool is designed with an easy to hold wooden handle whose tail is fitted with a steel ring to give it an elegant look. The wood handle has an isolating finish that keeps it comfortably warm. The pick is made of stainless steel and also comes with a wooden cover to shield the pick while not in use. It measures, 7.2 x 1.8 x 1.8 inches and weighs 3.4 ounces. 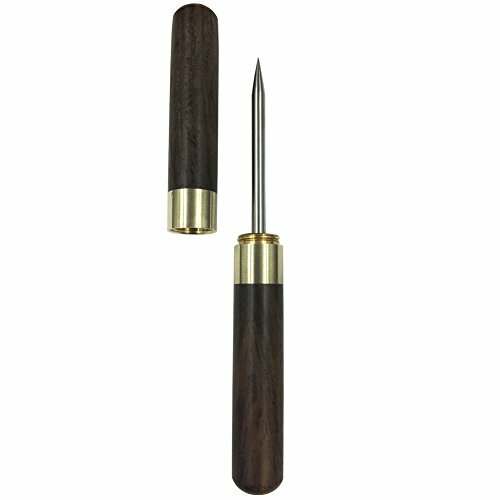 This stainless steel pick has long a bamboo handle that ensures a firm and non-slip grip while handling the tool. The handle also has a smooth finish to enhance the looks of your stainless steel. The bamboo-made sheath protects the pick from blunting or accidental injuries while not in use. The pick is 8.5 inches long and made from stainless steel. The tool measures 7 x 0.9 x 0.6 inches, weighs 2.4 ounces. 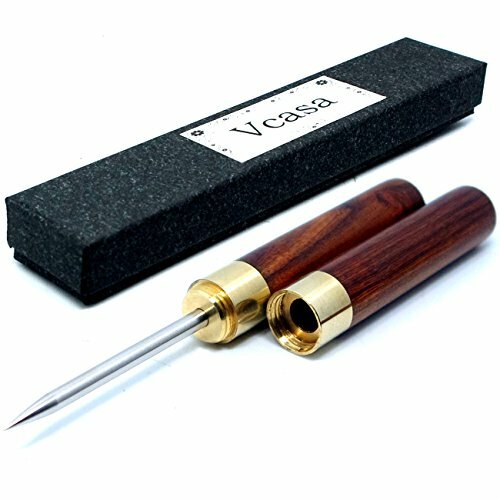 High Quality - The ice pick is made of premium stainless steel and natural wood, durable and convenient for daily use. This tool is designed to use high-quality materials and state of the art craftsmanship to withstand even the heaviest tasks of ice breaking. The Ontario made icebreaker measures 5 x 2 x 4 inches and weighs 1 pound. The pick has a thin diameter that makes ice breaking quick. The shaft is made of steel and, therefore, it is sturdy and resistant to corrosion and rust. This plated pick is also designed with a wood handle and gives users a firm grip while breaking the ice. The plated ice pick measures 12 x 2,7 x 1.3 inches (the pick itself is 6 inches long) and weighs 1.2 ounces. The manufacturer recommends washing hands before use as a precaution to avoid staining the wooden handle. 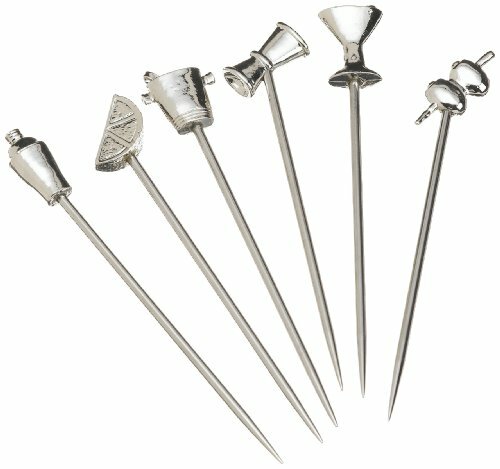 These are by far the best ice picks to buy if you want a product with an elegant, yet simple design. The manufacturer notes this tool should not be cleaned in a dishwasher, because the wooden handle can detach from the blade. This pick comes with a cover that protects your from accidental injuries and reduces dulling. The handle is made of wood that makes it easy to grip. The HIC is also suitable for cutting chocolate bars, according to some customer reviews. The manufacturer notes this ice pick should not be cleaned in the dishwasher. This tool comes in a set of six ice chippers with different designs. Both the handle, and the pick are made of stainless steel, which makes the ice picks easy to clean. The elegant design of this set of picks makes them ideal tools to be used at ice parties. Additionally, the picks make a great gift for a friend or family member who loves ice. These are the absolute best ice picks you could purchase in 2018 if you’re after a stylish product. 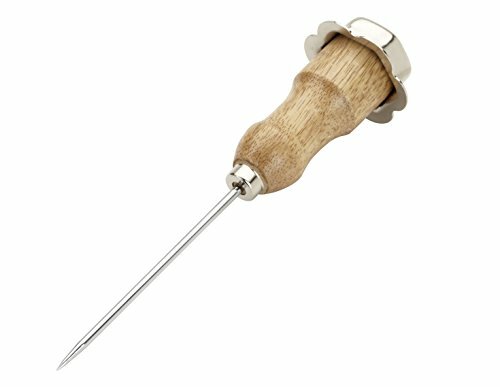 This awesome ice pick is made of stainless steel and wood handle. 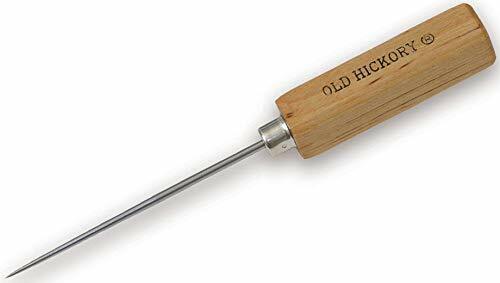 It’s a professional tool that can be used in residential kitchens as well and features a heavy-weighed ice crushing head apart from the common sharp pick. The seller offers a 100% money-back guarantee for this product so your purchase is basically risk-free. Most ice chipping tools are made of a wooden handle and a steel blade. Steel is probably preferred because it is durable, and rust and corrosion resistant. 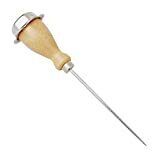 The best ice pick will have a cover that protects you from being injured by the sharp pick. 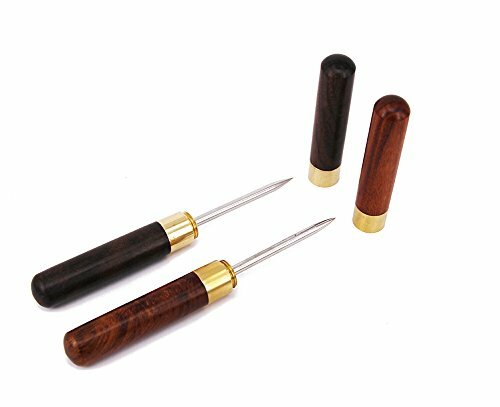 You may also love to purchase a picking tool whose handle and pick is made of steel because such tools last longer and are easy to clean. Each one of us has different opinions on what makes the best ice pick, which is why we would not mind if you share your opinion here.